Summer is just around the corner and we’ve been busy cleaning our patio and backyard, replacing patio cushions, planting bright flowers and getting summer ready. 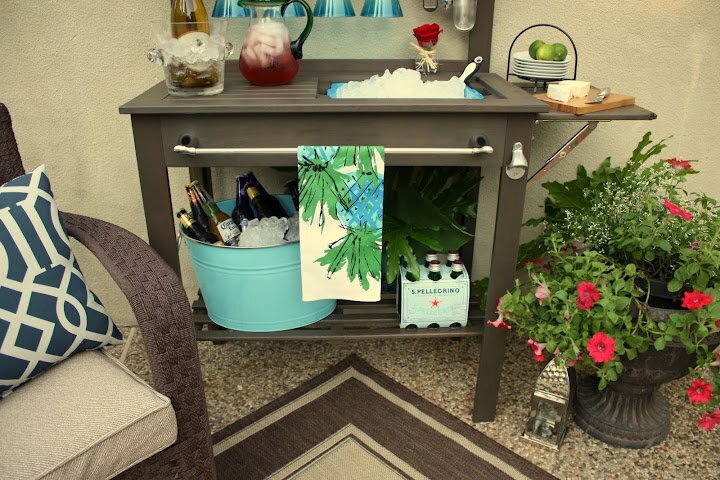 We love to grill and entertain during the summer and I was really hoping to find some sort of outdoor bar that I could use for serving beverages and appetizers. 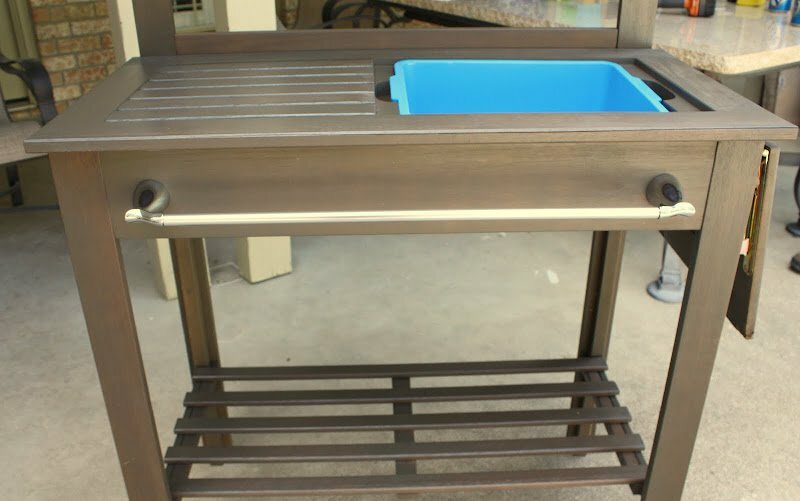 I haven’t been able to find anything even close to what I had in mind, so when I stumbled across this potting bench at World Market here, I thought why not turn a potting bench into an outdoor bar. When it’s really hot outside, I plan on placing a large frozen plastic blue cooler block in the base of the bucket (below the ice) to keep the ice cold. 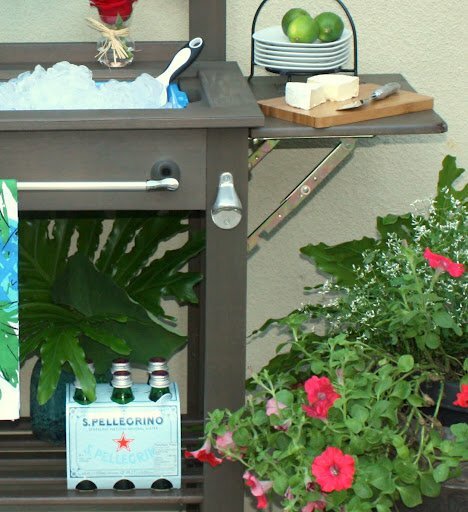 If you’re looking for an outdoor bar or a food serving bar, a potting bench is the perfect solution and you can pretty much add anything to it to really customize it for whatever you need. If you’re looking for something with more space, think about two of them together! I have already ordered a second one from World Market that I’m going to use for food. So many fun possibilities with these benches besides gardening. Have a wonderful week friends and I’ll be back on Friday morning with more outdoor inspiration for us on Friday Favorites. Thanks Amanda! Girl, c’mon anytime! Hugs!! I my gosh, this is awesome Cyndy! Wow, this is amazing! Totally have to get my husband on board (won’t be hard, with your lovely pictures!) in time for summer entertaining! Found you through Diane of In My Own Style. Love your blog! Thank you Jessica! Good luck with hubby! Brilliant. It looks expensive, well thought out and pretty with the blues and brown. What a cool idea and cool project! 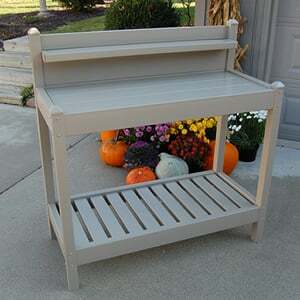 I keep thinking I want a potting bench, but who am I kidding? I’m a plant killer. Now a bar cart. I can drink. I can keep those beverages cold. That I can do! Linda, you sound like me! HA! That was about the same thought process I had! I cannot keep much alive but I can mix a mean cocktail!! Thanks Linda! Wow, great idea to use the bench as a bar. Looks great. i think this is sooo gorgeous with the blues, and such a smart idea! I love this! I think I feel a project (yet another one) in my future or should I say Hubby’s future! lol Thanks for sharing. Visiting from Savvy Southern Style. Thanks Shanee! Yep, my husband put it together too. He said it was very easy and quick to assemble. You’ll love having it! This is about the cutest thing I have ever seen. I am running to World Market down the street to hopefully get one myself. Thank you so much for sharing this idea. I’m stopping by from Wow Us Wednesday and I’m your newest follower. Thank you so much Kate! You will love having it! Thanks for stopping by and glad that you’re gonna follow along! Totally fun! 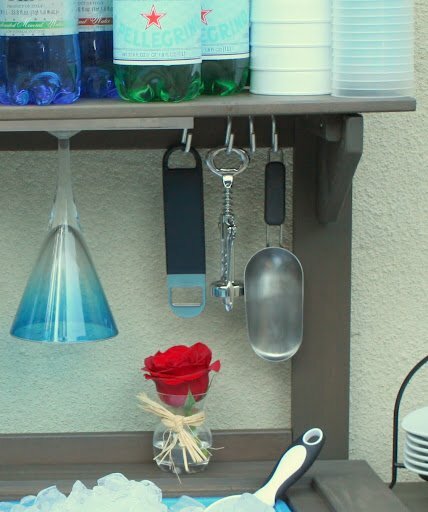 I’m working on a potting bench update, we really use it for beverages not potting – your added details are perfect! What a PERFECT repurpose! The sink is such a wonderful touch! I want one. 🙂 Your outdoor area is so pretty! I love this idea! I am always looking for ways to make entertaining easier. I have an old waterbed frame and headboard that I have planned to turn into a potting bench and this would be perfect for it! Thank you for sharing this idea! This is absolutely brilliant! I love the way it turned out. It looks as though it was meant to be. I am your newest follower! Great job!! What a fabulous idea for a potting bench. I love it and love the whole area with all those wonderful colors. Thanks for sharing at Wow. Wow, This is brilliant! I found you on Pintrest!! I showed my husband how cute this was and he agreed that it’s a sweet idea and super creative. 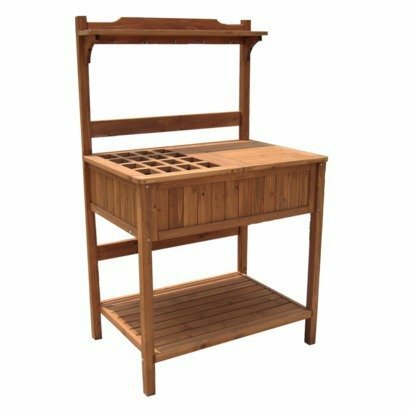 We looked up the potting bench and it’s currently on sale at Cost Plus for $83. Guess what I’m getting for my birthday tomorrow? Happy Birthday Dina and cheers girl to your new, fabulous bar!! Thank you! 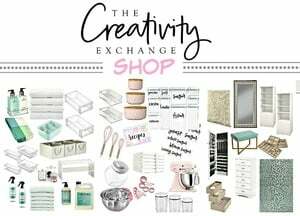 I just saw this amazing idea at Kim’s blog and had to come straight over to check it out! This is such a brilliant idea. I’m going to see if we can do something like this at our place. Thanks for sharing your fabulous idea! Thank you so much Natasha!! Oh I am green with envy! 🙂 I have been wanting to do one of these for a long time! Well done! Thank you Denise! I have been needing one myself for a long time and it has worked out great! Thank you so much for stopping by! Cheers! 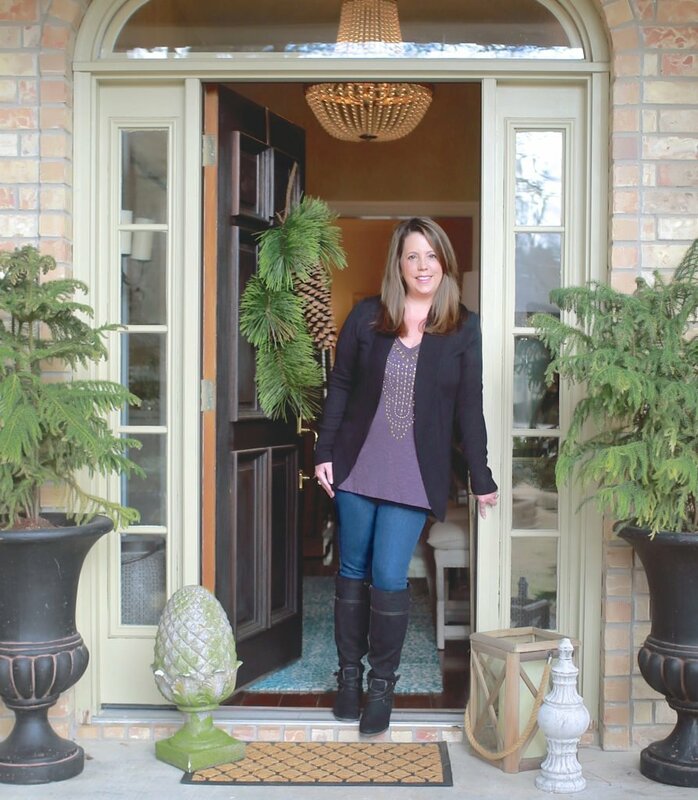 Stopping over from your feature at Savvy Southern Style to say hello and pin your most excellent bar. This is brilliant. I love it!!! Thank you to my spectacular fabulous friend!! Hugs girly! Loved this idea so much that I had to make one. 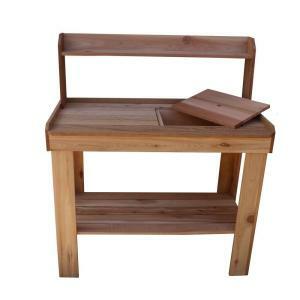 I just received my World Market potting bench that I ordered… which was on sale! I put it together yesterday and will be adding the “extras” today. Thank you Cyndy! What a sweet message Laura!! You made my day and I am thrilled that you could use the idea. You will love it and I have already used mine for two different gatherings and it really made things so much easier! Thank you so much for taking the time to send me a note! 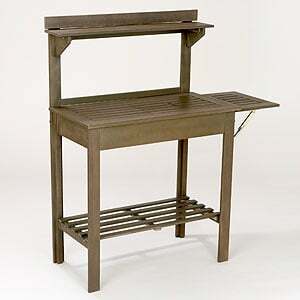 Oh my gosh, I have the exact same potting bench from World Market and I’m using it for a — wait for it — a potting bench. So boring. I’m pinning this post so I can remember it for the future. This is the best thing I have ever seen for a long time. I’m totally going to do this and put in our screened room. 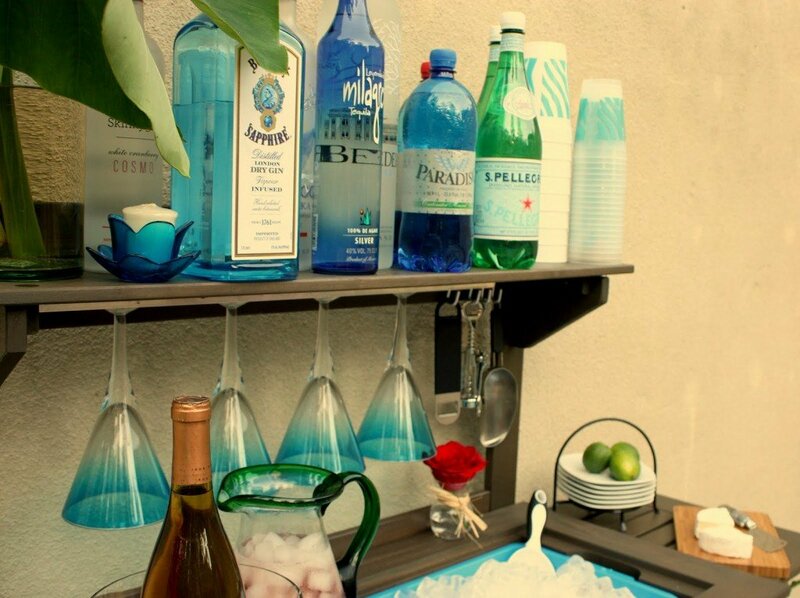 It’s PERFECT for us since we love hosting parties and entertain our friends with drinks. This is truly perfect! Now am on hunt for garden bench. Thank you for the inspiration. You rocks! This is genious. Thanks for the idea. Love the blue and green colors you chose too. Such a great idea! I think your place may be the summer hang out! I was searching the internet for this very thing and stumbled on your blog. Love! Thank you for the inspiration. The is one potting bench left at World Market in the entire bay area and my husband is picking it up as a birthday present right now. I can’t wait to get started! That is awesome Megan that you got the last one! It was meant to be girl! Happy Birthday and thank you so much for stopping by and I am thrilled you are inspired and I know you will love it! I love the multifunctional use! I’m going to buy one tomorrow. I love the colors you used too! Where did you get the beverage tub? 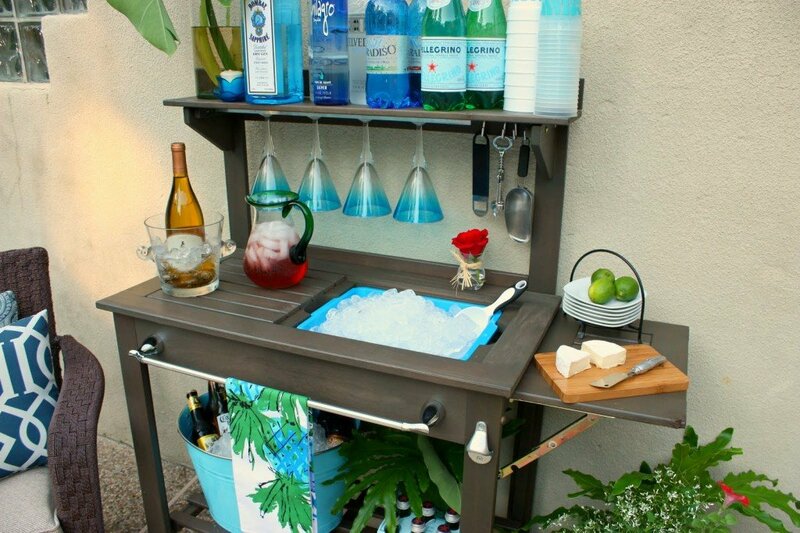 I love how creative this idea is, it’s as if it was always meant to be an outdoor bar. I especially like the colors and details you have added. I only wish I would have found your post last summer, before I got rid of a potting bench I had not used in a few years. 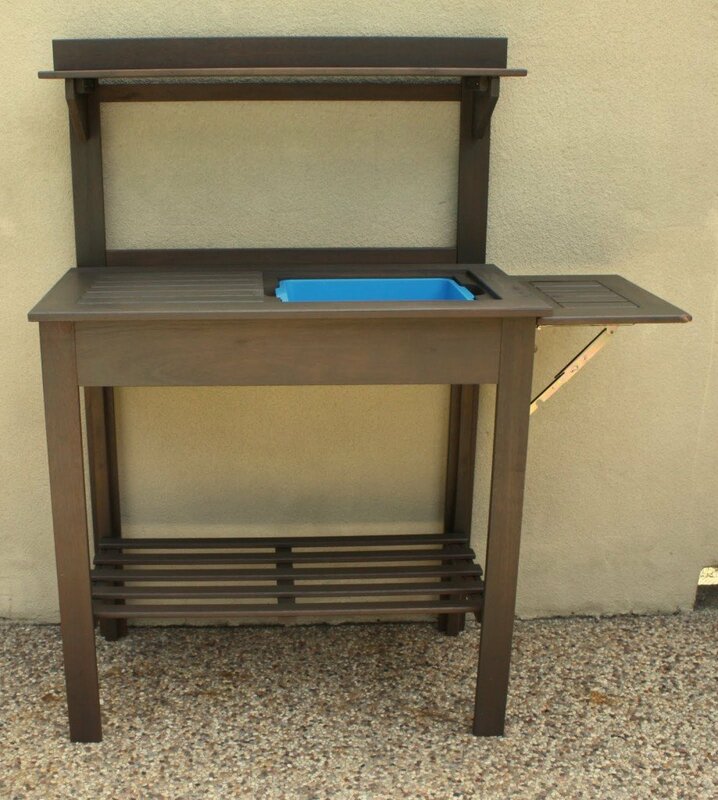 It was almost exactly like this one,just needed a new coat of stain(or left weathered) and some fastening of loose wooden slats, but It would have been a perfect addition poolside. I am hoping that whoever picked it up from our curb was lucky enough to find your post in time. I have pinned this and shared on my Facebook page! Thanks! What a great idea! Can you tell me where you found the wall mount bottle opener? Thanks! I’ve been eyeing this bench for a while now with similar intentions. I just want to say that the way you styled it couldn’t possibly be more charming. If I wasn’t already sold I sure am now! This piece is now on sale at World Market for $30.00. That’s right, $30 bucks. Unbelievable!!!!!! How can you go wrong now at that price. What a great idea! The final result really looks good. I just bought this bench from World Market because of you! 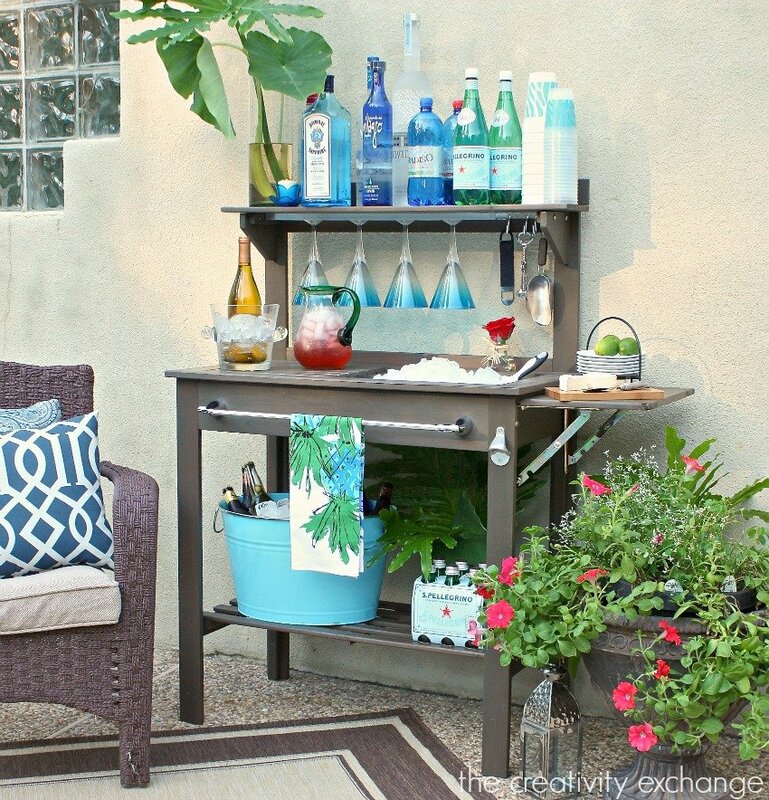 I’ve been looking for an outdoor console table for my patio, but this is 1,000 times more creative. Thank you for the idea! I’ve been stalking this DIY for over a year. I finally bought the potting bench from World Market and put it together yesterday. 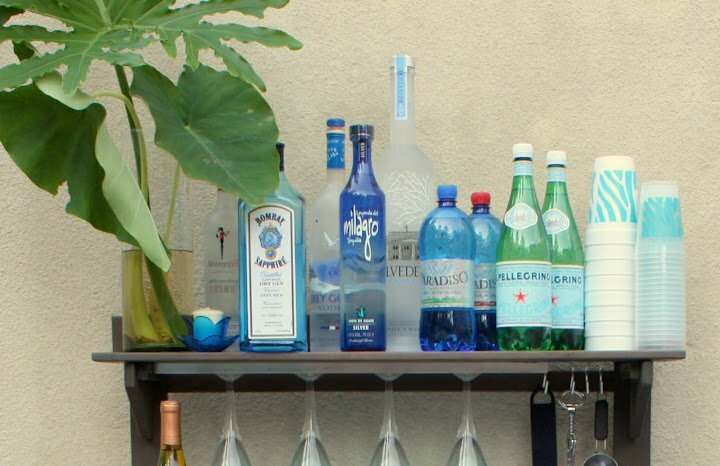 I’m so excited to have cocktails with my friends from my new outdoor bar. Thanks for the inspiration! This is an incredible idea! I just made this for my husband for his birthday, and I know he’ll LOVE it. In addition to your additions, I added a bit of insulation to the ice bucket and a small catch underneath the bottle opener. Awesome. Thanks for the idea. Thanks for posting this! This is just what I was searching for to add to my patio. It is perfect! Quick question Cyndy- where did you get the basin? I am actually looking for one that is a teal or mint green color as it will coordinate with patio decor. Also where on earth do you buy just a simple bottle opener like the one you put on? 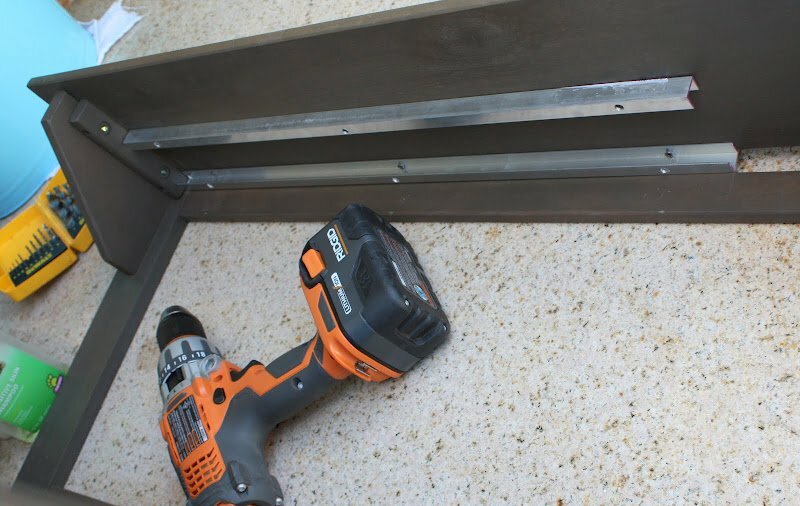 I have tried home depot, lowes etc and they dont have them. This is a must have. I bought my wall-mounted bottle opener from World Market too, but you can find them elsewhere if you Google it. Hi. I have been eyeing this project for a while now. We are redoing our backyard so now is a great time to try to do it. I am going to order the potting bench soon, just curious, how big were the channel trims? The rest I think I can figure out before i get it. Thanks and it looks amazing!!! Where did you get your towel bar from that you installed?